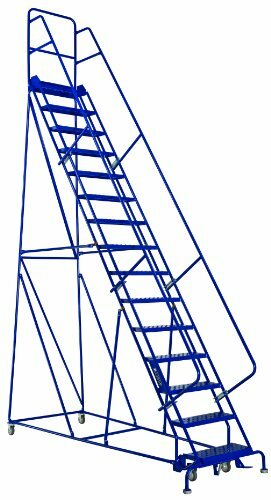 GSW2415 Steel Rolling Warehouse Ladders 15-step x 24" (with handrails). Baked-on finish is durable and provides superior scratch and scuff resistance. Locking Device - Comes equipped with a large 4" swivel caster in front and rigid casters in the rear 4" high toeboard, can be added as an option to smaller size models. 50 degree climbing angle does not meet ANSI requirements for forward descent. Louisville Ladder steel rolling warehouse ladders are considered one of the best on the market. Ladder equipped with ball bearing casters allowing easy movement to any area. Rugged all steel construction. Sturdy handrails, easy 56 degree climbing angle, "Sure Grip" tread, 7" deep steps and 10" deep top platform provide quality features for the everyday user.